In case any of you need proof that my brother is crazy... this is a picture one of his buddies took. No, it's not professional, no, it's not photoshopped. 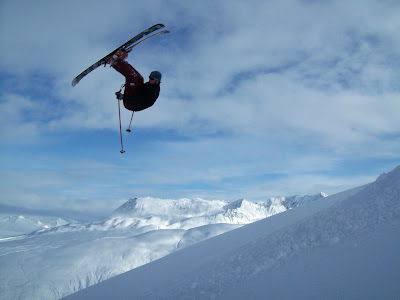 He really is doing a flip over a mountain range in Alaska. This is the second season he's worked as a guide for a heli-skiing company out of Valdez. He's good. Now he's home for a bit and hopefully we'll get to see him some. I think Cory misses his Uncle Kevin! How awesome would that be? I don't think I'd do it, but it looks fun!